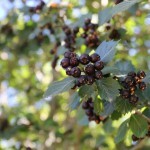 A shrubby tree with thorns, white flowers in mid-spring and black fruit in the summer. Prefers moist or wet habitats. It is native to the Pacific Northwest and found from Alaska to California and east to Michigan. Named for David Douglas, the Scottish botanical explorer.